Hisham Matar has been announced as the winner of the inaugural Rathbones Folio Prize. Matar received the award for THE RETURN; Fathers, Sons and the Land in Between, a profound and powerful memoir of his search, both physical and psychological, for his missing father. The Rathbones Folio prize, previously known as the Folio Prize, has a new remit and is now awarded to the best work of literature, regardless of form, written in English and published in a given year. Judges Ahdaf Souief (chair), Rachel Holmes and Lucy Hughes-Hallett chose the winner from a strong shortlist of eight, comprising four novels and four works of non-fiction, all of which were nominated by members of the Folio Academy. 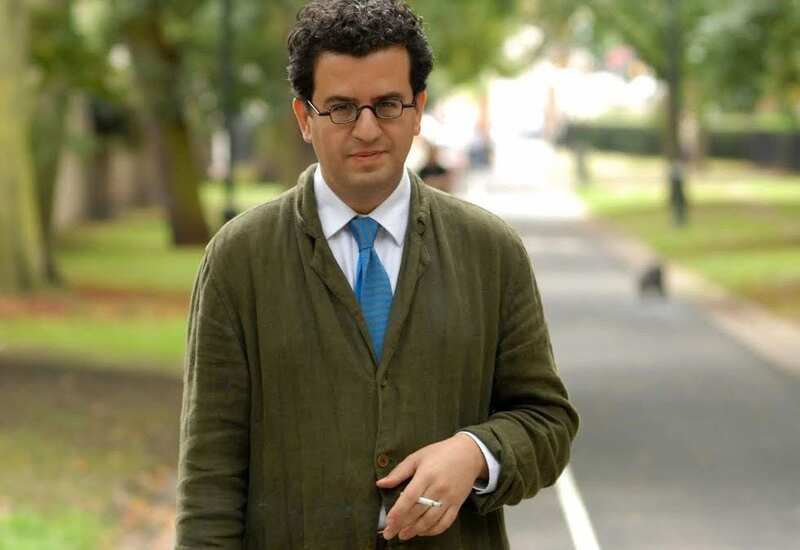 Hisham Matar was born in New York to Libyan parents and spent his childhood in Tripoli and Cairo; he has lived most of his adult life in England. His debut novel, In the Country of Men, won numerous international prizes and was shortlisted for the Man Booker Prize and the Guardian First Book Award. His second novel, Anatomy of a Disappearance, was published to great acclaim in 2011. The Return has recently been awarded the Pulitzer Prize for memoir and been shortlisted for four other major international prizes. Ahdaf Souief formally announced the winner at an Awards Ceremony held at the British Library on Wednesday 24th May, with over 350 people in attendance; Philip Howell presented the winner with a cheque for £20,000. The Award Ceremony was preceded by the Rathbones Folio Prize Shortlist Event at the British Library on Tuesday May 23rd. The eight finalists were chosen from a list of 62 titles, all of which were nominated by the Folio Academy. Chair: Ahdaf Soueif is the author of the bestselling The Map of Love (shortlisted for the Booker Prize in 1999 and translated into more than 30 languages), In the Eye of the Sun (1992), I Think of You and Cairo: A City Transformed, her account of the Egyptian revolution of 2011 (2014). She is also an influential political and cultural commentator. In 2007 Ms Soueif founded the Palestine Festival of Literature, which takes place in the cities of occupied Palestine and Gaza. Lucy Hughes-Hallett is the author of Cleopatra: Histories (1990), Heroes, Saviours, Traitors and Supermen (2005), and The Pike (2013) which won the Samuel Johnson Award, the Costa Biography Award and the Duff Cooper Award. Her first novel, Peculiar Ground, will be published in May. Lucy reviews regularly for The Sunday Times and served as a judge on the WH Smith Literary Award for 10 years and the Duff Cooper Prize for 5 years. Rachel Holmes is the author of numerous critically acclaimed books, including Scanty Particulars: The Life of Dr James Barry (2002), The Hottentot Venus: The Life and Death of Saartjie Baartman (2007) and Eleanor Marx: A Life (2014). She is currently writing a book about Sylvia Pankhurst. Rachel has judged a number of literary prizes, including the Orange Prize for Fiction and the Polari Prize, and in 2012 she became the UK Chair of the British Council 2012 Erbil Literature Festival in Iraq. China Miéville is an English author, comic writer, political activist and academic. He became a Fellow of the Royal Society of Literature in 2015. He has won the prestigious Arthur C. Clarke Award an unprecedented three times, and the British Fantasy Award twice. His novels, including The City & The City, Embassytown and Perdido Street Station, have all been published to dazzling critical acclaim. C.E Morgan‘s first novel, All the Living, was published in 2009. She was a recipient of a Whiting Writers’ Award in 2010 and was named by The New Yorker as one of their 20 writers under 40 and by the National Book Foundation as one of ‘5 Under 35’. The Sport of Kingshas also been shortlisted for this year’s Baileys Women’s Prize for fiction. C. E. Morgan lives in Kentucky. Maggie Nelson is an American poet, critic and author of books including Jane: A Murder, The Art of Cruelty: A Reckoning, and Bluets. She teaches in the School of Critical Studies at CalArts and lives in Los Angeles, California. She has received an Andy Warhol Foundation Grant, an NEA Fellowship in poetry, and a Guggenheim Fellowship in Non-Fiction, and The Argonauts won the National Book Critics Circle Award in Criticism and was a New York Times bestseller. Francis Spufford was born in 1964. He is the author of five celebrated books of non-fiction, including Unapologetic and Red Plenty. He has been longlisted or shortlisted for various prizes, and Golden Hill has already won the Costa First Novel Award. In 2007 he was elected Fellow of the Royal Society of Literature. He teaches creative writing at Goldsmiths College, University of London, and lives near Cambridge. Madeleine Thien is a Canadian short story writer and novelist born in Vancouver. Thien is primarily known for her novels dealing with the transcultural histories of Asian communities, and many of her works focus on time in connection to place and human emotion. Do Not Say We Have Nothing won the Governor General’s Award for English-language fiction, and was shortlisted for the 2016 Man Booker Prize and the 2017 Baileys Women’s Prize for Fiction. Robin Yassin-Kassab is a regular media commentator on Syria and the Middle East and the author of the novel The Road From Damascus (2008), and a contributor to Syria Speaks (2014). Leila Al-Shami has worked with the human rights movement in Syria and elsewhere in the Middle East. She was a founding member of Tahrir-ICN, a network that aimed to connect anti-authoritarian struggles across the Middle East, North Africa and Europe. The Folio Prize was established in 2013 as the first major English language book prize open to writers from around the world. It is the only literary prize in which all the books considered for the prize are selected and judged by an academy of peers. When new sponsors, Rathbone Investment Management, came on board the prize was expanded to include all works of literature, regardless of form. Previous winners were George Saunders in 2013 and Akhil Sharma in 2014. The Folio Prize Academy is a community of 300 + writers who represent excellence in literature and who may be called upon to comment on literature matters in the media, to appear at festivals and public events, and may volunteer to mentor young writers in association with the charity First Story. Academicians include Margaret Atwood, Carol Ann Duffy, Ian McEwan, Salman Rushdie and Zadie Smith, and recently recruited members include Amanda Foreman, William Dalrymple, Jon Ronson, Alex Ross and Andrew Marr. Rathbone Investment Management is one of the UK’s largest and longest-established providers of high-quality, personalised discretionary investment services. It manages over £35.8 billion* of funds (as at 5 April 2017) for individuals, charities and trustees, and is part of Rathbone Brothers Plc, an independently owned company with a listing on the London Stock Exchange. Investment management services are offered in Aberdeen, Birmingham, Bristol, Cambridge, Chichester, Edinburgh, Exeter, Glasgow, Kendal, Liverpool, London, Lymington, Newcastle and Winchester. Offshore investment management services are offered by subsidiary Rathbone Investment Management International in Jersey. The Literature/Folio Prize Foundation is a registered charity committed to bringing the most outstanding works of English language literature to public attention through the awarding of the Prize. Overseen by its trustees, the Foundation seeks to engage readers and writers throughout the English- speaking world in cultural debate and in the celebration and sustainment of the art of literature, which it believes has the capacity to enrich and change people’s lives.